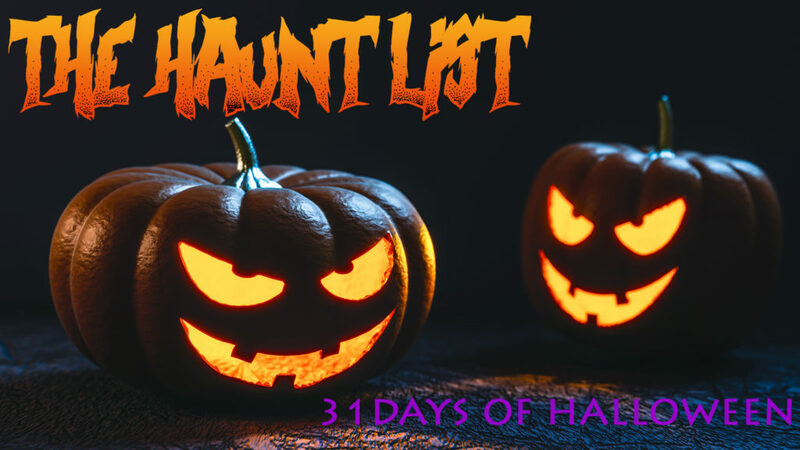 The Haunt List presents 31 Days of Halloween! Most of these haunts and activities are open select days throughout the month (some are year-round! ), so make sure to visit their site for additional dates and information. While we’ve included brief descriptions and age suggestions, we also recommend visiting each attraction’s website for age, health and mobility restrictions. North Hollywood, CA — We caught a preview of Fallen Saints earlier this year at Midsummer Scream and are eager to see the full length show. Fortunately 3 new dates have been added, October 1st, 8th & 15th at The Belfry Stage in North Hollywood! Force of Nature explores the Darkness with the latest chapter of their hit theatrical haunt experience, Fallen Saints: Dark. Corona del Mar, CA — Visit Roger’s Gardens’ boutique in all its Halloween glory! Wander the corridors of a magical school where witches and wizards learn their craft. Explore the Headmaster’s Study, a room filled with curiosities and antiquities. Each of the many rooms in their “castle” is filled with décor to fill your home with the spirit of Halloween. Anaheim, CA — Can you survive a horror film? Get cast in a horror movie flick and find out in this real life adventure game! Each player will take a quiz before the game to find out which character they are: The Nerd, Virgin, Jock, Rebel, Prom Queen or Detective. Your team will be divided up into separate rooms where you must work individually AND as a team. Not only do you need to escape, but you must also survive! Long Beach, CA — Head to the notoriously haunted Queen Mary for its annual Halloween haunt, Dark Harbor. It features 6 haunted mazes, a 4D theater experience, hundreds of monsters, immersive attractions, live entertainment, hidden themed bars and more to get you in the spooky holiday spirit! Los Angeles, CA — Be transported into an immersive world of ghosts, psychopathic clowns, vicious demons and Halloween magic at the Los Angeles Haunted Hayride. The event includes their staple hayride through the Old Zoo at Griffith Park, as well as the House of Shadows maze, trick or treating, live performances, the Scary-Go-Round and more! Corona, CA — Open this October for their 11th year of fear! Features 5 haunted attractions and the Dark Shadow Marketplace, all in one terrifying location. Fullerton, CA — Follow along with Paula for part four of her ongoing (and really messed up!) saga in The 17th Door: Crybaby. Get ready for an extreme and very interactive haunt experience unlike anything you’ve tried before! Be warned — the actors WILL touch you and there are intense scenes. Make sure to read the WAIVER before purchasing a ticket. Upland, CA — Black Market Escape Rooms is an immersive attraction company created by designer Jon Cooke, who is best known for some of Knott’s Scary Farms’ most thrilling installments, including The Depths & Paranormal Inc., as well as 2018 revamp of the Queen Mary Dark Harbor mazes. MURDERCO is billed as the nation’s first R-Rated horror escape room. For even MORE GORE visit Thursdays – Sundays in October. Read our review of the classic version HERE. Burbank, CA — Slashback Video is a celebration of horror’s VHS days, a time when mom and pop video stores ruled. It’s one part immersive horror VHS exhibit and one part art gallery located at the Bearded Lady’s Mystic Museum in Burbank. Los Angeles, CA — “Finding a house this cheap is rare in New York. You’re not one to believe the stories, but they say this home was refuge for one of the most evil spirits the small town of Amityville has ever known. All of the home’s past owners and families have disappeared without warning. Everyone in town tells you to get out while you can — loss is inevitable, and terror is unavoidable. We hope you enjoy your first night at your new home.” This is a timed 60 minute horror-themed escape room open year-round. 60out has highly detailed and insanely fun rooms at 7 locations in the Los Angeles area. Los Angeles, CA — Held for 19 years in a residential neighborhood, Boney Island comes to life this year in Griffith Park at the Los Angeles Live Steamers. Boney Island is spooky (not scary or gory!) fun for the whole family. North Hollywood, CA — Zombie Joe’s Underground Theatre Group is back with their cult horror hit, Urban Death. The Tour of Terror expands on the show, adding a haunted attraction before and after the performance where you’re taken through a pitch black maze with nothing but a flashlight. 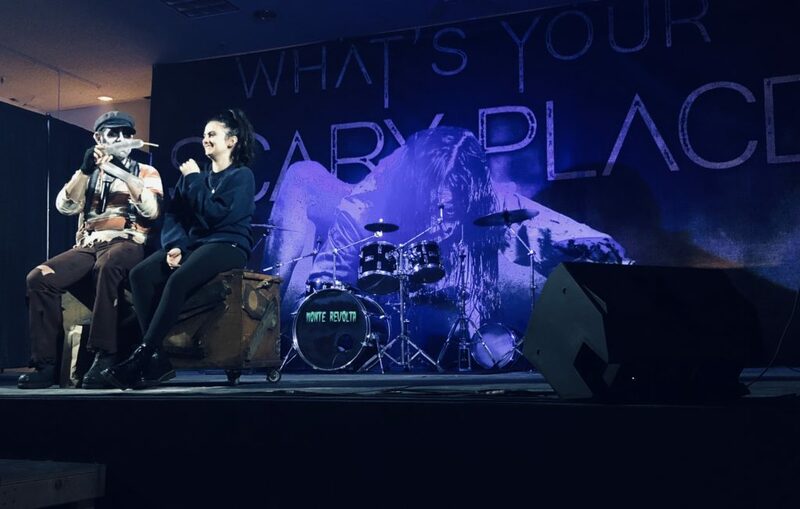 In an extremely intimate setting, attendees are treated to a terrifying theatre performance and with the disturbing skits and overall uneasy vibe, this show is unlike any other we’ve experienced. Laguna Hills, CA — Sinister Point returns this year with their biggest event yet! Haunts lovers will be scared to death with three stories and over 150,000 square feet of unrelenting terror. This event includes two terrifying walk-through attractions Phobias and Evil on 2, a thrilling haunted ride Boogeyman Express, scream zones with roaming scare actors, a creepy pitch-black escape room, stage shows, photo ops, games, vendors, food trucks and more! Universal City, CA — Universal Studios transforms by night into a three-dimensional world of horror featuring 8 walk-through mazes including Stranger Things, Poltergeist, and Trick ‘r Treat, the Hollywood Harry’s Dreadtime Storiez Terror Tram, a Jabbawockeez live show and scare zones. Anaheim, CA — ‘Mickey’s Halloween Party’ tickets may have vanished, but both parks still offer tons of seasonal excitement for all during Halloween Time at the Disneyland Resort—through October 31, 2018. Take pictures with costumed characters, ride the Haunted Mansion Holiday & Space Mountain Ghost Galaxy, enjoy hundreds of hand carved jack-o-lanterns on Main Street and much much more! Hollywood, CA — Sit back and relax on this guided tour of Hollywood’s dreary past. From the restaurant where Sharon Tate had her “Last Supper” to the pay phone in front of The Viper Room used for the River Phoenix’s 911 call, this tour hits it all. They cover Michael Jackson, Whitney Houston, John Belushi, Bela Lugosi, The Black Dahlia, and many more. Get within 6 feet of your favorites! Los Angeles, CA — JFI Productions tackles the subject of dreams in their new show, Creep LA: AWAKE, where audiences will enter the deep and strange abyss of nightmares. Continuing to expand on their unique brand of environmental theatre where guests feel like they’re inside of a horror movie, Creep LA: AWAKE is an expansive 75-minute, participatory experience across a massive 60,000 square foot performance space. Groups of 25 are invited to explore hidden scenes, intimate encounters and frightful stories. Los Angeles, CA — Warner Bros. Studio Tour Hollywood dares you to enter their iconic backlot for an incredible Halloween party where evil clowns, demon nuns, super villains, possessed dolls and the devil himself will come to life. Be prepared to face your deepest fears and see what nightmares await you from the twisted minds that brought you IT, The Conjuring, Freddy vs. Jason, The Exorcist, and from the DC Universe, Batman: Arkham Asylum. This special nighttime event includes walk through mazes, a tour of the lot (with a detour to everyone’s favorite campground, Camp Crystal Lake), props and costumes from the world of Tim Burton, a creepy carnival, live performances, DJs AND MORE! 13+; under 18 must be accompanied by an adult 18+; Lowest ticket prices 10/18 & 10/25! Long Beach, CA — Opening day of a three-day invasion of undead music, guts, horror and fun for the whole family. With costume and brain contests for all ages and stages of decay, and of course, thousands of Zombies, it would be horrific to miss this jam-packed event. If you’re on a budget, we suggest taking a mini-road trip to see this triple threat of highly impressive home haunts. While admission to each attraction is free, donations are encouraged. The Backwoods Maze – Burbank, CA — Visit the strange and amazing creatures of the Backwoods Maze. This free-entry home haunt in Burbank, CA was established in 2003 and continues to thrill guests from near and far! Rotten Apple 907 – Burbank, CA — This family-run home haunt has been in operation since 1990, and has grown into one of the most well-known home attractions in the area. What looks to be a play on Pinocchio, this year’s story is “Kilpetto’s Toy Shop”. If you’re spooked by mannequins and puppets, we suggest you stay away! Opechee Haunt – Glendale, CA — We peeped a preview of this mini-haunt at Midsummer Scream this year and were blown away! Almost more impressive than the detailed set design is the fact that the attraction is created and run by a group of teenagers. This walkthrough experience fully immerses guests into the eerie world of the 2001 cult classic film, Donnie Darko, featuring familiar environments, creepy character encounters, and more. Enter the mind of Donnie Darko, and discover the terrifying world that awaits you as you embark on a psychological journey like no other… completely ALONE. 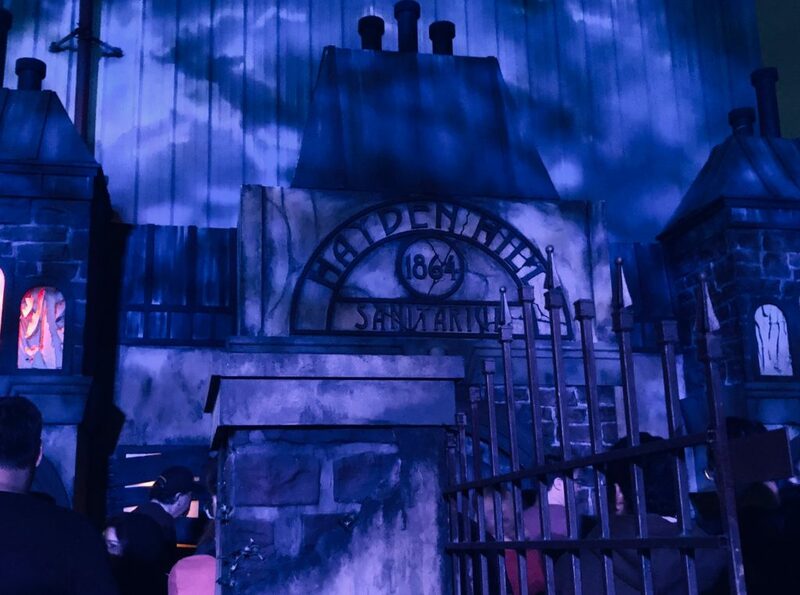 Santa Clarita, CA — Experience the latest in virtual reality technology in Wax House: The Legend of Jack The Ripper VR haunted house. The brand new multi-sensory virtual reality (VR) experience places you and up to three friends inside one of history’s greatest mysteries. You and your friends will be transported to London to uncover clues to unlock the secrets of The Wax House throughout the over 30 minute VR haunted house. Roam freely through 3,000 square feet of virtual space exploring the old abandoned wax museum to try and finally solve the century old question of who was Jack The Ripper. Hollywood, CA — Celebrate the 25th Anniversary of this Halloween classic by experiencing it in 4D! Watch the film in 3D while you are surrounded by sensory effects timed to the movie; lights, fog and scents plus more wind & snow than ever before! Fullerton, CA — You’ve started dreaming of an abandoned house and ever since, have become obsessed with the image. The house has been calling for you and pulling you in with an unknown force. Now that you’ve tracked down the location of the house you choose to enter. You open the door and become trapped. In this horror escape room you only have one hour to escape before you start to change. Thousand Oaks, CA — One of the most impressive home haunts in Southern California, Murder House Productions is back with an all-new theme. Get ready to relive the terrifying events surrounding the Milbury Massacre. In the quiet town of Southvale, Virginia, a local Urban Legend comes to life in RESURRECTION. Enter the dilapidated Milbury Farms barn where slaughtered livestock return from the dead to take revenge on the living. Calabasas, CA — Nights of the Jack is a Halloween Jack O’ Lantern experience tailored for all ages. The show features thousands of hand-carved, illuminated pumpkins, including some larger than life pumpkin installations as well as detailed artist depictions of your favorite movie stars, sports heroes and animated characters. This half mile long trail is self-guided, and guests usually spend at least an hour viewing all the fantastic pumpkin art. Buena Park, CA — As night falls, Knott’s Berry Farm turns into Knott’s Scary Farm: the largest Halloween experience in Southern California with menacing mazes, sinister shows, thrill rides and more, plus over 1,000 monsters roaming the park and lurking in the fog. New attractions th this year include The Depths and Dark Entities mazes, along with the Foresaken Lake scare zone. Culver City, CA — A family-owned and operated business focusing on bringing the farm to the city and celebrating the magic of Halloween by offering high-quality pumpkins and a fun-filled family experience. This super affordable family-friendly experience has a straw maze, petting zoo, bounce houses, face painting, and more! 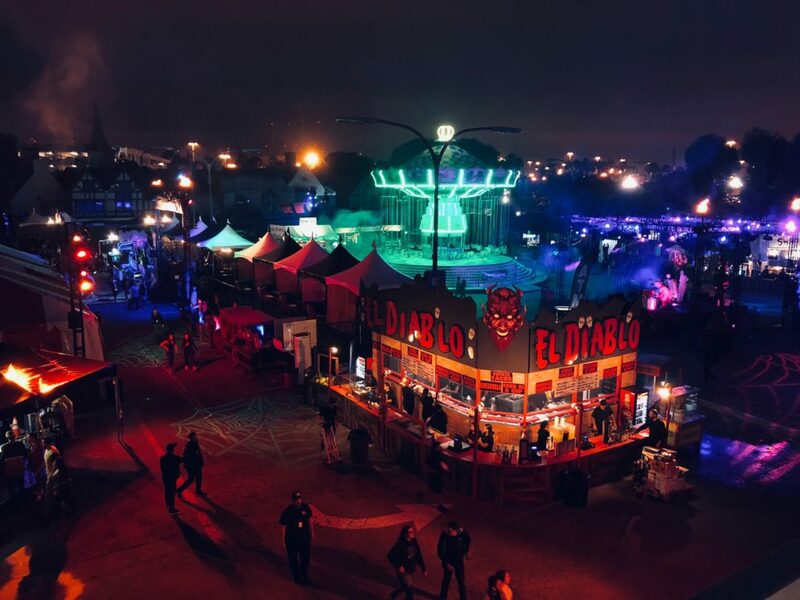 Valencia, CA — At night, Magic Mountain transforms into Fright Fest with mazes, scare zones, and the stuff of nightmares lurking around every corner of the park. Be sure to check out the three brand-new mazes: Condemned – Forever Damned, Sewer of Souls, and Hell Fest (based on the movie currently in theaters)! Rowland Heights, CA — Making its debut this year, Horrorworld brings three terrifying frights to one convenient location. Into The Black is a single person walk-through experience (that’s right, you’re going through completely ALONE) into the Black house, where the previous owners practiced devil worship, human sacrifice and demonic possession. The Psycho Sanitarium gives a first-hand look into their history of abused and neglected patients and asks the question “will you survive or join the restless residents?,” while The Fleshyard is haunted by the vengeful ghosts of a violently butchered family. Please note: Each attraction has their own individual ticketing. Thousand Oaks, CA — 105 bone chilling rooms, 8 different attractions, and over 23,000 square feet of fear! If that alone doesn’t hook you, this year also hosts two brand new attractions, “Inbred” and “The White-Out Experience”. While there is no age restriction, bringing babies, or forcing terrified children through the haunted house is discouraged. Los Angeles, CA — After catching a preview of Twisted Minds Productions mini-haunt at Midsummer Scream this year, we had to add it into our ‘must-see’ list. 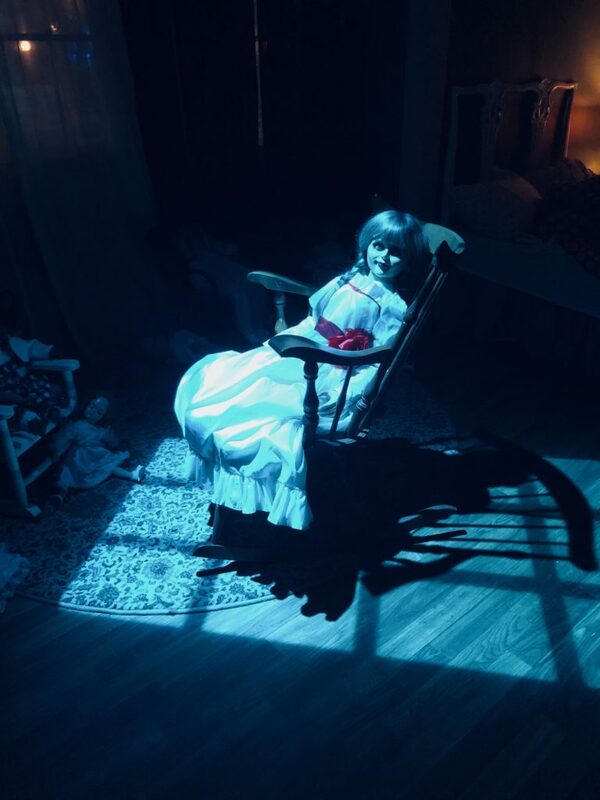 Anneliese: the experience is an immersive haunted house that will take guests through the true story of Anneliese Michel, a young girl who was possessed at the age of 16. Guest will embark on a research tour of the house and get a first person perspective of the possession and demonic events. Guided by two ghost hunters you will navigate dark hallways and rooms not knowing what demonic entity is around the corner. Tickets are only $3! I Like Scary Movies Experience Now Open!